Samsung Galaxy A3 (2017) is a dual SIM device that was launched in February 2017. Huge expandable storage and very good cameras are its major highlights. Samsung Galaxy A3 (2017) comes with 4.7 inch AMOLED touchscreen display, Corning Gorilla Glass 4 screen protector both at the front and back, 1280 x 720 pixels resolution and 312.47PPI pixel density. It is available in 4 colours including White, Gold, Pink and Black. It comes with a capacitive screen with multi touch facility. 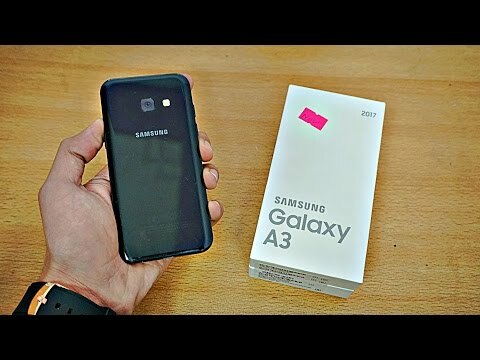 Samsung Galaxy A3 (2017) is built with a 12MP rear camera with 4000 x 3000 pixels resolution and 1.8f aperture and 8MP front camera with 1.8f aperture. Camera features include face detection, autofocus, LED flash, touch to focus, ISO control, exposure compensation, geotagging, HDR and panorama. It provides the facility of video recording at 1080p. It has an internal storage of 16GB that can be expanded up to 256GB with a micro SD card. This dual SIM device is loaded with 2500mAh Li-ion non-removable battery. Users can enjoy connectivity through 4G LTE (India Compatible), 3G, 2G, Wi-Fi 802.11, b/g/n, Mobile Hotspot, Bluetooth v4.1, GPS with A-GPS, NFC and micro-USB 2.0. It takes in 1 regular and 1 Nano SIM card. Samsung Galaxy A3 (2017) faces competition from Lenovo K5 Note, Moto G4 Plus and Vivo V3. Lenovo K5 Note, Moto G4 Plus and Vivo V3 have a bigger screen, better camera and higher battery capacity than Samsung Galaxy A3 (2017). Ans: Yes, the Samsung Galaxy A3 (2017) supports OTG. Ans: No, the Samsung Galaxy A3 (2017) comes with a non-removable battery. Ans: Yes, the Samsung Galaxy A3 (2017) supports Reliance Jio Network. Ans: It comes with Android 6.0 Marshmallow and will receive the Nougat update soon.